The Ohio Railway Museum is currently working to restore the last Columbus streetcar known to be in existence. 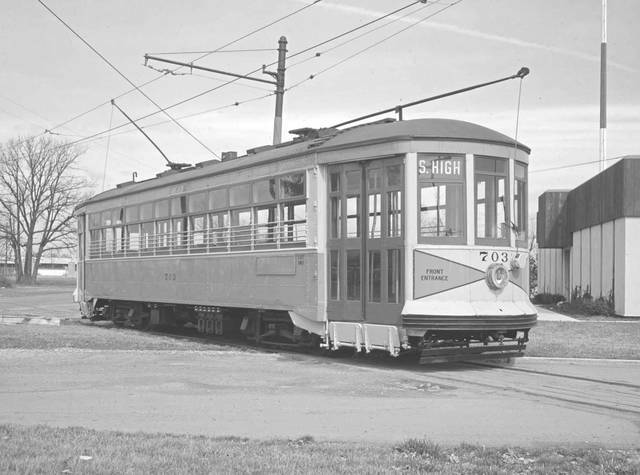 Pictured is what streetcar 703 originally looked like. The Ohio Railway Museum in Worthington is in the process of restoring the last existing Columbus streetcar. 703, built in 1925 by the G.C. Kuhlman Car Company, is the last existing Columbus streetcar. It weighs 36,620 pounds and is a little over 45 feet long. It can seat 48 passengers and two crew members. Streetcars first arrived in Columbus in 1863 but were pulled by horses until around 1888 when they then were powered by electricity. The last true streetcar finished its route in Columbus on Sept. 5, 1948. 703 ferried passengers along Parsons and Neil avenues and High Street into Clintonville during the roaring 20s and Depression. 703 was donated to the Ohio Railway Museum in 1962. Visitors enjoyed tours and rides until it became time for it to be put into storage awaiting its time for restoration. That time is now! 703 and the museum need the public’s help to bring the 703 back to life and once again allow visitors to enjoy taking a step back into history to learn about the last existing Columbus streetcar. Any donation will help bring this car back into operation. The Ohio Railway Museum is located in Worthington and is operated by volunteers. It was founded in 1948 and is one of the oldest railway museums in America. The museum is designed to educate through displays and demonstrations, the role and effects of the railroad in the life of people and businesses of Ohio and the United States. The museum is a nonprofit organization. Those interested in helping the museum restore this piece of railroad history can do so by visiting the museum’s GoFundMe page at https://www.gofundme.com/bring-703-back-to-life. Submitted by the Ohio Railway Museum in Worthington.